Eagled-eyed fans have uncovered some tantalizing Battlefield 3 news in a place that most people wouldn't think to look. 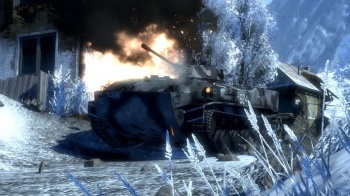 EA Dice has let slip that Battlefield 3 will support the blowing up of walls and the flattening of buildings. This information wasn't announced however, it was tucked away in the description for a talk at next year's GDC. In either very late February, or very early March, DICE's Kenny Magnusson will talk about some of the difficulties that the studio faced in creating the lighting for Battlefield 3. Nestled in the description for the talk, among the HDR, particle lighting and real-time radiosity architecture, is a small snippet of text that refers to Battlefield 3's maps as "highly dynamic", "varied," and most interestingly, "destructible." Presumably, Magnusson will speak at length about some of the challenges in lighting a level that can change in unpredictable ways. This news isn't a huge surprise; after both of the Battlefield: Bad Company games, and Battlefield 1943 featured destructible environments, it makes sense that Battlefield 3 would follow suit. The game runs on a more advanced version of the Frostbite engine, however, we could be in for more detailed devastation than we've seen in previous titles.